security « The SQL Dude! I heard of these interesting requirements when working with one of my customers. If I were to break it down, there are 2 types of scenarios where we want to restrict access to SQL Server. Only the main application which uses a SQL Login should be able to connect to the SQL Server. None of the Windows Logins or any other login should be able to connect the SQL database. In order words, the SQL database should be accessed only by the Application Login and no one else. Access to SQL Server and the database should be only through a custom application and no other application including SQL Server Management Studio, SQLCMD etc. should allow users to access the database. The easiest and secure way of preventing other logins from accessing SQL Server is through Logon Triggers. You might wonder why this is an issue, when only required logins are added in SQL Server. Think of a scenario where the database is deployed on client machines and obviously the client machine means the user will be an Administrator on his own machine. A perfect example of this is SQL Server Express databases. You can use Logon Triggers to prevent Windows logins or other logins from accessing SQL Server. Logon triggers are fired every time a new connection is established to SQL Server. Just like regular triggers we can perform a ROLLBACK which will roll back the connection if the login is not your application login. For this example assume that your application has a login called “MyApplicationUser” and this is the only login that should have access (even the local Administrator must not be able to access SQL Server). When a user who isn’t in the logon trigger exception list above tries to connect, they will get this error. Logon failed for login ‘Domain\TestUser1’ due to trigger execution. Changed database context to ‘master’. Changed language setting to us_english. Every time a user who isn’t SA or MyApplicationUser tries to connect to SQL Server and failed with error given above, you will see the following information in the audit table including the login name, client machine name, application name etc. Be careful when creating logon triggers as any mistake/bug in your code logic, will block you and then you wont be able to connect back in again. If you are in such a situation, then you can use the Dedicated Admin Connection (DAC) to make a connection and then disable/drop the logon trigger. Connections via the DAC don’t fire login triggers and there can be at max 1 DAC connection for an entire instance. DAC can enabled from sp_configure. As a best practice, make sure you have DAC enabled on all your SQL instances, because it is a life-saver in situations like this . To make a DAC connection use the -A switch, sqlcmd -A -D master or Admin:ServerName from SSMS. Scenario #2 is a little more interesting and more complicated. Basically, the ask is to prevent all database access except from 1 specific client application. So even tools like SSMS, SQLCMD, Profiler etc. should not be able to connect to SQL Server. We can still implement a reasonable amount of security using Logon Triggers, but it is not 100% fool-proof. With the same logon trigger code given above, we need to use the program_name from sys.dm_exec_sessions to check if this program is allowed to establish a connection to SQL Server. This is the output from the Auditing table to track the applications and users who tried to connect to SQL Server. The catch with this method is the the program_name or application name is not really a fool-proof method, since it is very much possible for someone to provide the correct application name in the connection string and get connected to SQL Server. There is a property called ApplicationName which can be set in the connection string. So if the application name is known, anyone can write a program to provide that name in the connection string and gain access to SQL Server. If we use the [Application Name] property in the connection string, then even if we have logon triggers, it will allow the user to connect to SQL Server, since we are just matching the application name which is specified in the connection string. A more secure approach you could use for this is called "Application Roles". When connecting from an application you assume a particular role and only that role is granted privileges required in the database. So all apps connect via this mechanism and don’t give out SQL or NT logins for any unauthorised use. You will have to call sp_setapprole in your application with a password, once the connection is established. Once this call succeeds then the connection gets the privileges of the application role and loses privileges of the actual user, which is what we want. So if someone tried to connect to the database from SSMS or SQLCMD, they will access the DB using their credentials, which won’t have the required permissions on the tables, since only the application role has the rights on the tables. This is more secure & reliable approach, but one that requires application code change and as a DBA you will have to create the application role in SQL Server. The steps to create application roles are given in Books Online. I thought I had seen it all in SQL Server. But life finds a way of throwing a few surprises and WTF moments in your way. I happened to be working with a customer who had some Windows users and these users had complete access over SQL Server. They were able to login, access all databases & tables, create new databases, drop databases (yes!) etc. Now, these Windows logins weren’t a part of the SQL logins in sys.syslogins at all. How did they gain access? Where are they getting the complete equivalent of sysadmin permissions from? 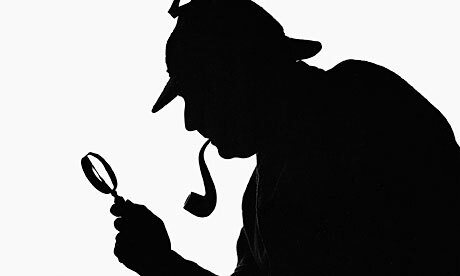 Thus begins the story of the curious case of public logins and how Dr.Sherlock went about solving the mystery. Conan Doyle on…..
2. Check if this Windows login is part of any Groups, that are part of the logins. 3. If so, check what permissions this group has on the instance/database and what roles these Groups belong to. Okay, what this told me was that there were 2 Windows Groups added as logins to SQL Server, but this login was a part of only 1 group and this group AD\GroupXYZ did not have sysadmin [EXEC sys.sp_helpsrvrolemember ‘sysadmin’] or database access. ??@!#*@!#!@#! Since my initial testing had revealed that with this login create/drop/backup etc. were possible, this login is obviously having some higher level privilege in SQL Server akin to what the SA would have. I had already checked sysadmin role and this login/group wasn’t a part of the role. There are 3 scenarios in SQL Server where logins have implied access to a database. By “implied” I mean that a login need not be mapped to any database, but this login can still have complete access to the database. 1. Part of the sysadmin server role. Not many people know or pay attention to the 3rd point about Control Server permissions. CONTROL SERVER is a new permission available starting with SQL Server 2005 and it grants the same access level as being a member of the sysadmin fixed server role. But still, I didn’t have an answer to how this login was able to access the database ProdDB. I opened a new query window with this login and started a profiler trace from my SA account adding all the “Security Audit” events to the trace, and filtering it on the SPID number from my query window connection. Here is what I observed when I ran a “select * from dbo.employees” table. 1. The login name was “sudarn2\testuser”, which is my windows login. 2. The login was accessing my database “test” as a public user. Aha! As you can see above, the select succeeded and I was able to read all the data as a public user! You can see each column definition for the event Audit Schema Object Access Event Class here. This is starting to make sense now as to how the user is able to access all the databases, which being mapped to none. This user was accessing the database under the context of public user. But out-of-the-box, SQL Server definitely does not have any such permission granted to public user. This must be some customized public user then. I use the following query to find out what Server Level permissions the public user had been granted using the DMV sys.server_permissions. As you see in the Table 2 above, the public role has been granted a bunch of Server Level permissions which are un-necessary and pose a security risk. The most important of them all is the CONTROL SERVER permission, as this alone is enough to gain sufficient permissions equivalent to a sysadmin. The control server granted to public implies other permissions like ALTER ANY DATABASE, SHUTDOWN, ALTER ANY LOGIN etc. The full list of permissions implied by Control Server is given here. So we finally have an answer to who (public) and how (control server granted to public). This was how an un-mapped user was able to access a user database like ProdDB and read/edit data etc., all because someone threw the security best practise book into the trash and decided to grant pretty much every server permission to the public role. What to do to fix this gaping security hole? After the above command was executed by SA, the windows user is now unable to access any database he isn’t mapped to, which is what we wanted. But as a further test, we created a new SQL login called testuser and mapped it to 1 specific user database. When we tried to login using testuser, the login failed with this error. When I checked the SQL error log, I saw the following 18456 error getting logged. 2012-03-28 23:33:33.570 Logon Error: 18456, Severity: 14, State: 11. State:11 means the login is valid, but lacks server permissions. I used the same query above or this one below to see what permissions public role now had at the Server level. I saw the after revoking the CONTROL SERVER permissions, the other implied permissions were gone and now only the “VIEW ANY DATABASE” permissions was granted. Going back to Table 2. above we know that by default SQL Server has granted 5 Server permissions to public and out of this 4 of them are on ENDPOINTS. One of each protocol type: TCP, Named Pipes, Shared Memory and VIA. These were missing. I granted these back so as to reset public back to the original out-of-box configuration. Once I did this, the test login testuser was able to successfully make a connection to SQL Server. 1. For those of you DBA’s out there, who don’t want any user/login accessing the SQL Server instance, the 4 endpoint permissions above would be an ideal candidate to revoke from public. Once this is done, no one except sysadmins can connect to SQL Server. 3. Just running the above is not enough, since you need to take care of granting connect permissions to your actual application logins, e.g. db_appadmin. If you revoke as given in step #2 and stop there, then you will get into deep trouble and none of your application users will be able to connect to SQL Server. The login will fail with Msg: 18456, State:11. You will need to specifically grant connect on endpoint permissions to each of those logins (for all the 4 protocols) which needs to connect to the SQL instance. Well, thus ends the strange but interestingly curious story of public role access and how to control it. I have some more T-SQL code and samples covering public & Guest users. Read through this blog post of mine for more details on how to go about curbing public rights and its pros & cons. It’s all elementary my dear Watson . I had authored a post on this a couple of weeks back to detect mismatch between DBO User & database owner. I had also included how to find the various groups a windows login belongs to using the login’s token in sys.login_token. I continued working on this script and finished it last week. One of the problem’s was the login token view is only useful when you have logged in via the User itself. If you are an admin you will get results from the Admin login token, which isn’t useful in detecting permissions. DBO Owner Login to Database Owner Mapping. Members of DB_OWNER role in each database excluding the DBO user itself (including permissions via AD Groups). Summary: Identify those users who are DBO mapped logins, but they do NOT have explicit login NOR are they are part of DB_OWNER role. You can think of this as a complete security auditing script for AD Logins, groups, Database Owner/DBO validity. This section gives you the mapping between the database owner in sys.databases and the login which owns the DBO User in each database. If you move databases between servers, its possible that the old DBO Login doesn’t exist on the new instance and this could cause unauthorized access by the old DBO id he/she has login access to the server, then he/she retains DBO access in the newly moved database. 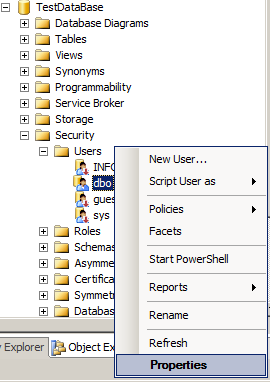 This section presents to you the different Active Directory Groups that have DBO/DB_Owner access in each database. Sometimes, if you have too many AD Groups in different OU’s, for a DBA it gets confusing to manage the authorized access. You can certainly manually look up the AD Users and figure this out. But, being a SQL person I’m sure its a lot more comfortable seeing this within SQL Server itself. This script does just that and shows the diff groups per each database. Since we are anyways getting DBO Owner login we might as well detect the different users who are part of DB_OWNER fixed database role. Each member of DB_OWNER role has Full Control on the database. Hence the need to track this information. This is the one that does the magic! It gives a final report of each user who has DBO Access, but who isn’t a part of DB_OWNER role nor does this person has sysadmin through any of the AD Groups. It also reports all the AD Group, through which this windows user can get a login access to SQL Server thereby gaining DBO Access when switching context to the database reported against the user’s name. If you see any results here, then its very much a security hole, that needs to be plugged after careful review of this user’s individual object rights. The commented line on a.group_name in the final section, is for you to add any AD Groups which each user in the organisation is a part of, thereby removing any unnecessary rows from the output. I was working with one of my customers and came across a unique scenario, so I thought it share it out here. My customer had multiple Active Directory groups which were added as logins in SQL Server. Some of these groups had access to only certain databases and some had sysadmin rights. It so happens that certain users were part of multiple AD groups, so we need to track down the security chain to see which of these groups were granting access & permissions to these databases. 1. The Windows user is also a login in SQL Server as well as the Group is a login. 2. The Windows user does not have a login in SQL Server but only via the Group. In case #1, the user will access based on the login’s access rights. In case #2, if the user were part of multiple groups how do we determine which group was granting his permissions inside a database. Luckily, we have a view that lets you see what groups are part of a login’s token called as sys.login_token. This displays the login token for the currently logged in session. We need to filter this to report only those groups which are in the login’s token and which are also a valid login in SQL Server. Once you have this information, you can then focus on these groups listed here to see what access rights they have on the database in question. Here is a sample query to check your access rights on objects in a database. In SQL Server each database has a user called as ”DBO”. This is a built-in user who is the owner of the database. The DBO user has full-control of the database and the access rights are not explicitly visible on each database, but understood to be granted. So if my windows login CONTOSO\testuser was the owner of database “AdventureWorks”, then within this database AdventureWorks, my login contoso\testuser will be known as DBO. There can only be 1 DBO user in a database. Don’t get confused with db_owner database role. This role can be used to grant other logins dbo rights, meaning all access rights are the same, but those logins will be added as users to the database. But the database owner itself will not have a user inside the database, because he is the DBO user. There is 1 scenario, where the DBO user can be mapped to an invalid login. If the database was attached from one server where loginA was the DBO and the moved to another server where loginA does not even exist, then you will see that loginA is still the DBO. Of course, during the attach you can change the db_owner, but this is not something that people generally do. You can use the following script to identify all the databases whose DBO user is mapped to an invalid login. Once identified you will have to correct is using any of the below commands. In the result, pay careful attention to the second output as that lists all the DBO users whose login does not exist on this instance of SQL Server, along with the database name. You will need to correct that using the any of the 2 methods listed above for each of the database listed in the 2nd output. That’s all for now folks. Stay safe, stay secure!